Having a great set of gutters professionally installed by Iron Horse Gutterworks is the best way to make sure that you’re protecting the foundation of your Syracuse home and your basement. By diverting water away from your roof and foundation properly, you are saving yourself time, money, and a lot of frustration. However, many of us work hard during the spring and summer months to maintain a beautiful lawn and garden space for ourselves and others to enjoy. These can sometimes become casualties of moving water away from the edges of your home when not combined with an effective gutter drain system. As your preferred gutter drain service and gutter installation experts, we’ve put together a list of the best ways to handle gutter drain runoff to protect your lawn and keep you Barbecuing all season long. Popularized by Henry Flagg French, an Assistant US Treasury Secretary in the mid-1800s, French drains (also known as drain tiles) have been helping people in New York safely move water away from their property for over 150 years. A French drain is an effective, simply constructed ditch dug at a slight incline to allow the flow of water away from areas that typically gather standing water. Place the trench in an area where water naturally gathers or runs to for your best results. Lay in a light gravel base, and a geotextile or landscaping textile material of your choice to allow runoff, to prevent the shifting of sand and rock, or the intrusion of root systems which can clog your drain. Next, place a perforated pipe in your trench, ensuring that it follows the grade created for your runoff. Fill the majority of the trench with gravel or rock and cover with it with your textile. Then, lay your sod back in and enjoy a firmer, dryer lawn. One environmentally friendly and great looking solution for handling runoff from your gutter drains is to install a rain garden. Unlike the French drain mentioned above, a rain garden is built almost like a miniature wetlands reservoir in your yard. This low lying area becomes a catch-all for water directed to it, but is filled with plants that hold up well to your region and don’t mind having “wet feet.” Here is a list of plants that make a great rain garden in Syracuse. The idea is to funnel the runoff from your gutter drains into the rain garden so it doesn’t cause damage and erosion to other, less resilient parts of your yard. In the case of avoiding fast moving water and overflow from water impervious surfaces like concrete and tile, make sure to place the rain garden in the path of the water flow for best results. A properly designed rain garden should use light enough soils and gravel to allow sitting water to seep into the ground within 24 hours, meaning you don’t need to worry about mosquitos, smell, or other concerns you may have about standing water. The New York State Department of Environmental Conservation has strongly encouraged rain gardens in recent years as they are proven to effectively prevent erosion and prevent water runoff contamination of other water sources. Sometimes the biggest culprit of water saturation in your lawn can be the landscaping decisions made by you or a former owner of the home. 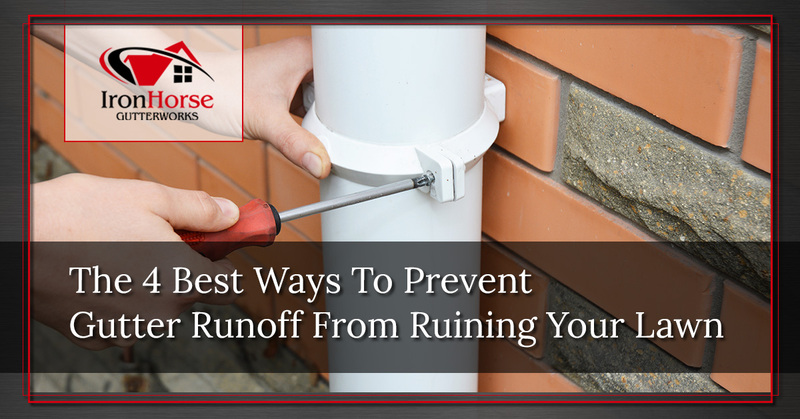 When your outdoor space is largely covered with water impermeable surfaces like concrete or tile, the runoff from your gutter drains has less area to absorb into the soil, meaning that the areas that can help with runoff get over soaked and ruined. Making the decision to remove hard surfaces from your yard and replace them with sod, soil, or other water permeable materials isn’t always easy, but sometimes is still the best way to protect the integrity of your yard and recreation space. Always remember to call your local service 811 before you dig to make sure that you aren’t creating unsafe or costly risks for yourself. Learning more about the type of soil on your property can also help you understand which of the options explored here might be best for you and your home. 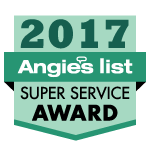 And remember, Iron Horse Gutterworks is proud to be your preferred local Syracuse gutter drain and installation experts. We are always happy to answer questions or provide guidance for all your gutter and gutter drain needs. Contact us to get a free quote today.